Writing a novel is easy. Writing a good novel is hard. That’s just life. If it were easy, we’d all be writing best-selling, prize-winning fiction. This page is the most popular one on my web site, and gets over a thousand page views per day. Over the years, this page has been viewed more than six million times. So you can guess that a lot of people find it useful. But you may not, and that’s fine by me. Look it over, decide what might work for you, and ignore the rest! If it makes you dizzy, I won’t be insulted. Different writers are different. If my methods get you rolling, I’ll be happy. I’ll make the best case I can for my way of organizing things, but you are the final judge of what works best for you. Have fun and . . . write your novel! Good fiction doesn’t just happen, it is designed. You can do the design work before or after you write your novel. I’ve done it both ways and I strongly believe that doing it first is quicker and leads to a better result. Design is hard work, so it’s important to find a guiding principle early on. This article will give you a powerful metaphor to guide your design. Our fundamental question is this: How do you design a novel? For a number of years, I was a software architect designing large software projects. I write novels the same way I write software, using the “snowflake metaphor”. OK, what’s the snowflake metaphor? Before you go further, take a look at this cool web site. At the top of the page, you’ll see a cute pattern known as a snowflake fractal. Don’t tell anyone, but this is an important mathematical object that’s been widely studied. For our purposes, it’s just a cool sketch of a snowflake. If you scroll down that same web page a little, you’ll see a box with a large triangle in it and arrows underneath. If you press the right-arrow button repeatedly, you’ll see the steps used to create the snowflake. It doesn’t look much like a snowflake at first, but after a few steps, it starts looking more and more like one, until it’s done. I claim that that’s how you design a novel — you start small, then build stuff up until it looks like a story. Part of this is creative work, and I can’t teach you how to do that. Not here, anyway. But part of the work is just managing your creativity — getting it organized into a well-structured novel. That’s what I’d like to teach you here. If you’re like most people, you spend a long time thinking about your novel before you ever start writing. You may do some research. You daydream about how the story’s going to work. You brainstorm. You start hearing the voices of different characters. You think about what the book’s about — the Deep Theme. This is an essential part of every book which I call “composting”. It’s an informal process and every writer does it differently. I’m going to assume that you know how to compost your story ideas and that you have already got a novel well-composted in your mind and that you’re ready to sit down and start writing that novel. But before you start writing, you need to get organized. You need to put all those wonderful ideas down on paper in a form you can use. Why? Because your memory is fallible, and your creativity has probably left a lot of holes in your story — holes you need to fill in before you start writing your novel. You need a design document. And you need to produce it using a process that doesn’t kill your desire to actually write the story. Here is my ten-step process for writing a design document. I use this process for writing my novels, and I hope it will help you. Step 1) Take an hour and write a one-sentence summary of your novel. Something like this: “A rogue physicist travels back in time to kill the apostle Paul.” (This is the summary for my first novel, Transgression.) The sentence will serve you forever as a ten-second selling tool. This is the big picture, the analog of that big starting triangle in the snowflake picture. When you later write your book proposal, this sentence should appear very early in the proposal. It’s the hook that will sell your book to your editor, to your committee, to the sales force, to bookstore owners, and ultimately to readers. So make the best one you can! Shorter is better. Try for fewer than 15 words. No character names, please! Better to say “a handicapped trapeze artist” than “Jane Doe”. Tie together the big picture and the personal picture. Which character has the most to lose in this story? Now tell me what he or she wants to win. Read the one-line blurbs on the New York Times Bestseller list to learn how to do this. Writing a one-sentence description is an art form. Step 2) Take another hour and expand that sentence to a full paragraph describing the story setup, major disasters, and ending of the novel. This is the analog of the second stage of the snowflake. I like to structure a story as “three disasters plus an ending”. Each of the disasters takes a quarter of the book to develop and the ending takes the final quarter. I don’t know if this is the ideal structure, it’s just my personal taste. If you believe in the Three-Act structure, then the first disaster corresponds to the end of Act 1. The second disaster is the mid-point of Act 2. The third disaster is the end of Act 2, and forces Act 3 which wraps things up. It is OK to have the first disaster be caused by external circumstances, but I think that the second and third disasters should be caused by the protagonist’s attempts to “fix things”. Things just get worse and worse. You can also use this paragraph in your proposal. Ideally, your paragraph will have about five sentences. One sentence to give me the backdrop and story setup. Then one sentence each for your three disasters. Then one more sentence to tell the ending. Don’t confuse this paragraph with the back-cover copy for your book. This paragraph summarizes the whole story. Your back-cover copy should summarize only about the first quarter of the story. An important point: You may find that you need to go back and revise your one-sentence summary and/or your one-paragraph summary. Go ahead! This is good–it means your characters are teaching you things about your story. It’s always okay at any stage of the design process to go back and revise earlier stages. In fact, it’s not just okay–it’s inevitable. And it’s good. Any revisions you make now are revisions you won’t need to make later on to a clunky 400 page manuscript. Another important point: It doesn’t have to be perfect. The purpose of each step in the design process is to advance you to the next step. Keep your forward momentum! You can always come back later and fix it when you understand the story better. You will do this too, unless you’re a lot smarter than I am. Step 4) By this stage, you should have a good idea of the large-scale structure of your novel, and you have only spent a day or two. Well, truthfully, you may have spent as much as a week, but it doesn’t matter. If the story is broken, you know it now, rather than after investing 500 hours in a rambling first draft. So now just keep growing the story. Take several hours and expand each sentence of your summary paragraph into a full paragraph. All but the last paragraph should end in a disaster. The final paragraph should tell how the book ends. This is a lot of fun, and at the end of the exercise, you have a pretty decent one-page skeleton of your novel. It’s okay if you can’t get it all onto one single-spaced page. What matters is that you are growing the ideas that will go into your story. You are expanding the conflict. You should now have a synopsis suitable for a proposal, although there is a better alternative for proposals . . . Step 5) Take a day or two and write up a one-page description of each major character and a half-page description of the other important characters. These “character synopses” should tell the story from the point of view of each character. As always, feel free to cycle back to the earlier steps and make revisions as you learn cool stuff about your characters. I usually enjoy this step the most and lately, I have been putting the resulting “character synopses” into my proposals instead of a plot-based synopsis. Editors love character synopses, because editors love character-based fiction. Step 6) By now, you have a solid story and several story-threads, one for each character. Now take a week and expand the one-page plot synopsis of the novel to a four-page synopsis. Basically, you will again be expanding each paragraph from step (4) into a full page. This is a lot of fun, because you are figuring out the high-level logic of the story and making strategic decisions. Here, you will definitely want to cycle back and fix things in the earlier steps as you gain insight into the story and new ideas whack you in the face. Step 7) Take another week and expand your character descriptions into full-fledged character charts detailing everything there is to know about each character. The standard stuff such as birthdate, description, history, motivation, goal, etc. Most importantly, how will this character change by the end of the novel? This is an expansion of your work in step (3), and it will teach you a lot about your characters. You will probably go back and revise steps (1-6) as your characters become “real” to you and begin making petulant demands on the story. This is good — great fiction is character-driven. Take as much time as you need to do this, because you’re just saving time downstream. When you have finished this process, (and it may take a full month of solid effort to get here), you have most of what you need to write a proposal. If you are a published novelist, then you can write a proposal now and sell your novel before you write it. If you’re not yet published, then you’ll need to write your entire novel first before you can sell it. No, that’s not fair, but life isn’t fair and the world of fiction writing is especially unfair. Step 8) You may or may not take a hiatus here, waiting for the book to sell. At some point, you’ve got to actually write the novel. Before you do that, there are a couple of things you can do to make that traumatic first draft easier. The first thing to do is to take that four-page synopsis and make a list of all the scenes that you’ll need to turn the story into a novel. And the easiest way to make that list is . . . with a spreadsheet. For some reason, this is scary to a lot of writers. Oh the horror. Deal with it. You learned to use a word-processor. Spreadsheets are easier. You need to make a list of scenes, and spreadsheets were invented for making lists. If you need some tutoring, buy a book. There are a thousand out there, and one of them will work for you. It should take you less than a day to learn the itty bit you need. It’ll be the most valuable day you ever spent. Do it. Make a spreadsheet detailing the scenes that emerge from your four-page plot outline. Make just one line for each scene. In one column, list the POV character. In another (wide) column, tell what happens. If you want to get fancy, add more columns that tell you how many pages you expect to write for the scene. A spreadsheet is ideal, because you can see the whole storyline at a glance, and it’s easy to move scenes around to reorder things. My spreadsheets usually wind up being over 100 lines long, one line for each scene of the novel. As I develop the story, I make new versions of my story spreadsheet. This is incredibly valuable for analyzing a story. It can take a week to make a good spreadsheet. When you are done, you can add a new column for chapter numbers and assign a chapter to each scene. Step 9) (Optional. I don’t do this step anymore.) Switch back to your word processor and begin writing a narrative description of the story. Take each line of the spreadsheet and expand it to a multi-paragraph description of the scene. Put in any cool lines of dialogue you think of, and sketch out the essential conflict of that scene. If there’s no conflict, you’ll know it here and you should either add conflict or scrub the scene. I used to write either one or two pages per chapter, and I started each chapter on a new page. Then I just printed it all out and put it in a loose-leaf notebook, so I could easily swap chapters around later or revise chapters without messing up the others. This process usually took me a week and the end result was a massive 50-page printed document that I would revise in red ink as I wrote the first draft. All my good ideas when I woke up in the morning got hand-written in the margins of this document. This, by the way, is a rather painless way of writing that dreaded detailed synopsis that all writers seem to hate. But it’s actually fun to develop, if you have done steps (1) through (8) first. When I did this step, I never showed this synopsis to anyone, least of all to an editor — it was for me alone. I liked to think of it as the prototype first draft. Imagine writing a first draft in a week! Yes, you can do it and it’s well worth the time. But I’ll be honest, I don’t feel like I need this step anymore, so I don’t do it now. Step 10) At this point, just sit down and start pounding out the real first draft of the novel. You will be astounded at how fast the story flies out of your fingers at this stage. I have seen writers triple their fiction writing speed overnight, while producing better quality first drafts than they usually produce on a third draft. You might think that all the creativity is chewed out of the story by this time. Well, no, not unless you overdid your analysis when you wrote your Snowflake. This is supposed to be the fun part, because there are many small-scale logic problems to work out here. How does Hero get out of that tree surrounded by alligators and rescue Heroine who’s in the burning rowboat? This is the time to figure it out! But it’s fun because you already know that the large-scale structure of the novel works. So you only have to solve a limited set of problems, and so you can write relatively fast. This stage is incredibly fun and exciting. I have heard many fiction writers complain about how hard the first draft is. Invariably, that’s because they have no clue what’s coming next. Good grief! Life is too short to write like that! There is no reason to spend 500 hours writing a wandering first draft of your novel when you can write a solid one in 150. Counting the 100 hours it takes to do the design documents, you come out way ahead in time. About midway through a first draft, I usually take a breather and fix all the broken parts of my design documents. Yes, the design documents are not perfect. That’s okay. The design documents are not fixed in concrete, they are a living set of documents that grows as you develop your novel. If you are doing your job right, at the end of the first draft you will laugh at what an amateurish piece of junk your original design documents were. And you’ll be thrilled at how deep your story has become. Over the years, I’ve taught the Snowflake method to hundreds of writers at conferences. I’ve also had this article posted here on my web site for a long time, and the page has now been viewed over 6,000,000 times. I’ve heard from many, many writers. Some people love the Snowflake; some don’t. My attitude is that if it works for you, then use it. If only parts of it work for you, then use only those parts.I write my own novels using the Snowflake method. Make no mistake — it’s a fair bit of work. For a long time, I did it the hard way, using Microsoft Word to write the text and Microsoft Excel to manage the list of scenes. Unfortunately, neither of those tools knows about the structure of fiction. Finally, I realized that it would be a whole lot easier to work through the method if the tools were designed specially for fiction. So one day I decided to create that software. I wanted something that would automate every step that could be automated. The result was a commercial software package I call Snowflake Pro. It makes my own Snowflaking incredibly easier, and it’s now doing the same for zillions of other writers. 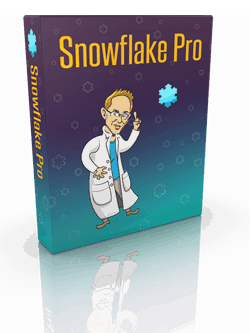 Snowflake Pro makes the Snowflake method fast, easy, and fun. It runs on Macs, Windows, and Linux. 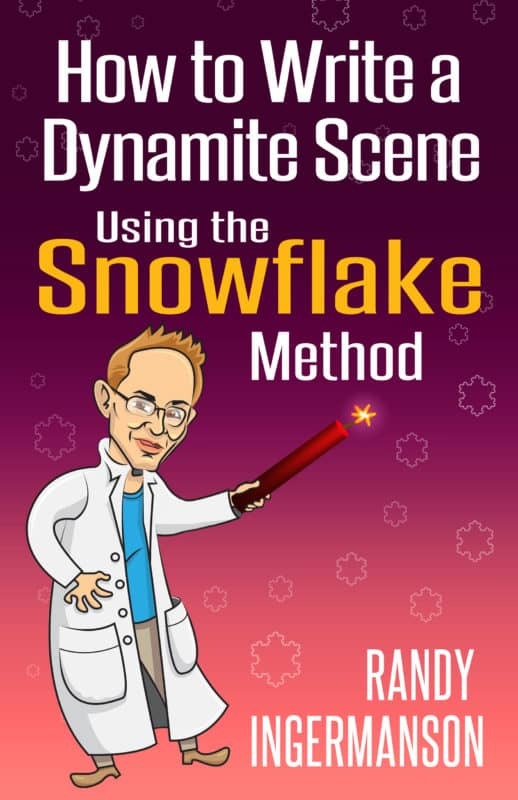 Currently, I’m running a special promotion that gives a 50% discount on this cool and fun tool for anyone who owns a copy of my book How to Write a Novel Using the Snowflake Method. Are you struggling right now with a horrible first draft of your novel that just seems hopeless? Take an hour and summarize your story in one sentence. Does that clarify things? You’ve just completed step (1) of the Snowflake, and it only took an hour. Why not try the next few steps of the Snowflake and see if your story doesn’t suddenly start coming to life? What have you got to lose, except a horrible first draft that you already hate? Are you a seat-of-the-pants writer who finally finished your novel, but now you’re staring at an enormous pile of manuscript that desperately needs rewriting? Take heart! Your novel’s done, isn’t it? You’ve done something many writers only dream about. Now imagine a big-shot editor bumps into you in the elevator and asks what your novel’s about. In fifteen words or less, what would you say? Take your time! This is a thought game. What would you say? If you can come up with an answer in the next hour . . . you’ve just completed Step 1 of the Snowflake! Do you think some of the other steps might help you put some order into that manuscript? Give it a shot. What have you got to lose? Have you just got a nightmarishly long letter from your editor detailing all the things that are wrong with your novel? Are you wondering how you can possibly make all the changes before your impossible deadline? It’s never too late to do the Snowflake. How about if you take a week and drill through all the steps right now? It’ll clarify things wonderfully, and then you’ll have a plan for executing all those revisions. I bet you’ll get it done in record time. And I bet the book will come out better than you imagined. If the Snowflake Method works for you, I’d like to hear from you. You can reach me through the contact page on my web-site. Acknowledgments: I thank my many friends on the Chi Libris list and especially Janelle Schneider for a large number of discussions on the Snowflake and much else. Want to Learn More About the Snowflake Method? 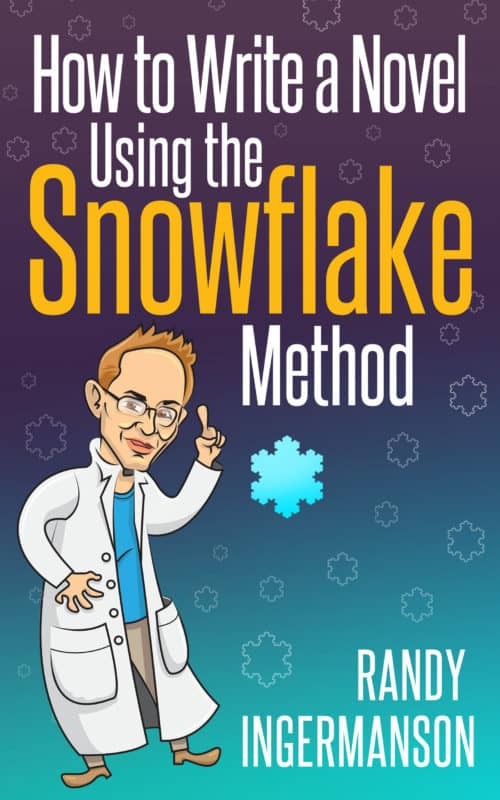 Check out my best-selling book, How to Write a Novel Using the Snowflake Method. This book is a different kind of teaching tool. It uses a story to SHOW you how to write a novel, rather than to TELL you how to write a novel. I used the Snowflake Method to help me write the book, and at the end, you get to see the Snowflake document I created for the book, exactly the way I wrote it. If you learn best by seeing examples, you might like this book. It’s about a young woman who’s been dreaming all her life about writing a novel. Her parents always told her that fiction writing was “impractical,” and they made her get a practical college degree. But now that she’s married and has two kids in school, she decides to do something just for herself, for once in her life. She’s going to write that novel and nobody is going to stop her. The only thing blocking her is herself. Randy Ingermanson is a theoretical physicist and the award-winning author of six novels. He has taught at numerous writing conferences over the years and publishes the free monthly Advanced Fiction Writing E-zine, the largest electronic magazine in the world on the craft of writing fiction, with over 17,000 readers. German: Read the German translation here. German: Read a different German translation here. Italian: Read the Italian translation here. Russian: Read the Russian translation here. French: Read the French translation here. Spanish: Read the Spanish translation here. Japanese: Read the Japanese translation here. Czech: Read the Czech translation here. Brazilian Portuguese: Read the Brazilian Portuguese translation here. Serbian: Read the Serbian translation here. If you know of other translations, please let me know about them on my Contact page. Translators: If you’d like permission to do a translation, email me on my Contact Page. After you complete the translation, let me know and I’ll include a link to your translation here.